OAuth2 Authorization Challenge or Patient Consent Form? John Moehrke, the track co-chair, initially suggested this track to review a sample paper consent form from AHIMA, and implement similar functionality to capture consent digitally by using HL7 FHIR resources like Consent and CommunicationRequest. During the first track meeting, several track participants raised the question as to why a separate patient consent form is needed when in fact the OAuth2 authorization challenge asks a user exactly the same questions as asked by a consent form. User instructs their app (pre-registered with Cerner) to get patient data from the EHR server using OAuth2. OAuth2 requires server to redirect the user to a log-in screen to authenticate themselves. 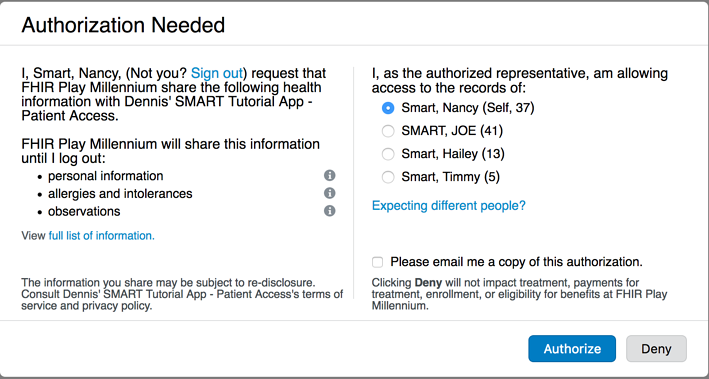 Here, the user (Nancy Smart) is instructing the Cerner EHR (FHIR Play Millennium) the specific health record categories (not just for Nancy, but also for her dependents) the EHR should share with the client application (Dennis’ SMART Tutorial App - Patient Access). If the categories of health records presented in the Cerner’s OAuth2 challenge (personal information, allergies, etc.) 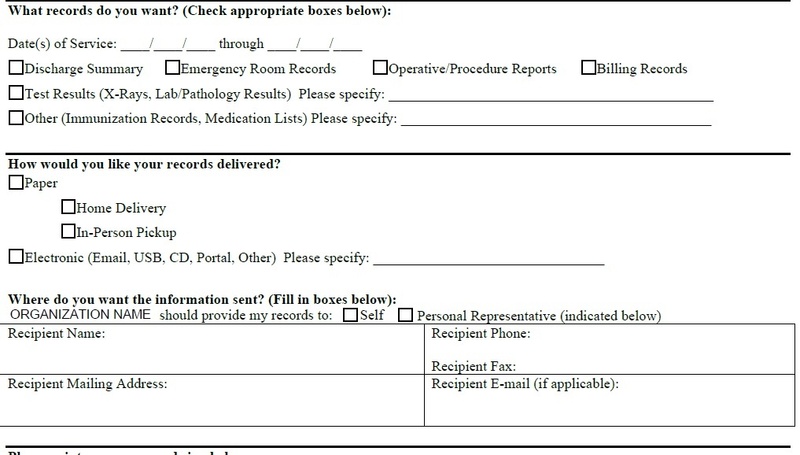 are customized to match the categories in AHIMA’s consent form (discharge summary, emergency room records, etc. ), then the act of a patient like Nancy making her selections in the OAuth2 challenge should be the same as her signing a patient consent form. Can We Use OAuth2 Authorization Challenge to Capture Patient Consent? So , why don’t we just use the OAuth2 challenge to capture patient consent? Clearly, OAuth can capture the essential information to represent patient consent, but can it replace the current practice of patients signing consent forms? To drive adoption, we need to examine the needs of both providers as well as of the patients, and also the underlying policy requirements. Technically, a provider can capture a patient's response to OAuth2 challenge as a Consent FHIR resource, which can then replace paper/PDF forms as the legal record of patient consent. Also, the Consent resource can be shared with patient apps so they can keep track of a patient’s consent preferences across multiple providers (and avoid duplicate data entry in future). However, the use of the FHIR Consent resource or the OAuth2 authorization challenge are NOT about meeting the exact legal definition of "consent", "authorization", "directive" in a given country or state. Rather, they provide a MEANS to meet the legal/policy requirements of electronically sharing patient data (in any given locale) WITHOUT requiring the patient to sign paper (or even PDF) forms. They are about making sharing friction-less while still meeting legal/policy requirements. 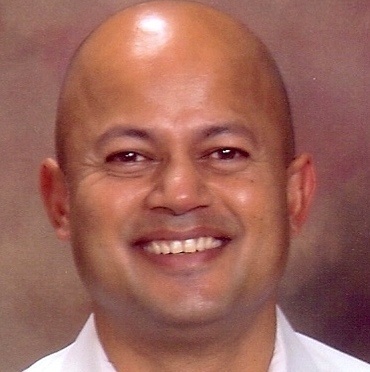 So if we want to enable consumer health app developers to pull patient health records from a provider, or instruct a provider to share patient health records with another provider, we can greatly benefit by first enabling providers to design their OAuth2 authorization challenge as a patient consent form. This way, patient consent can be digitally recorded during the OAuth dance, and providers can share patient health records with the patient health apps much more efficiently, while still meeting the policy and regulatory requirements.